The Somat Hydra-Extractor component is an integral part of a foodservice waste system comprised of a disposer or remote pulper and a Hydra-Extractor. After processing, slurry is pumped through a pipeline to the Hydra-Extractor. Most of the water is extracted from the pumped slurry resulting in a semi-dry pulp. The extracted water is recovered and pumped back to the pulper for re-use. Foodservice waste enters the pulper, is processed then mixed with water to create a pulpable slurry comprised of approximately 95% liquid and 5% solids. The slurry is transported through a pipeline to the Hydra-Extractor. 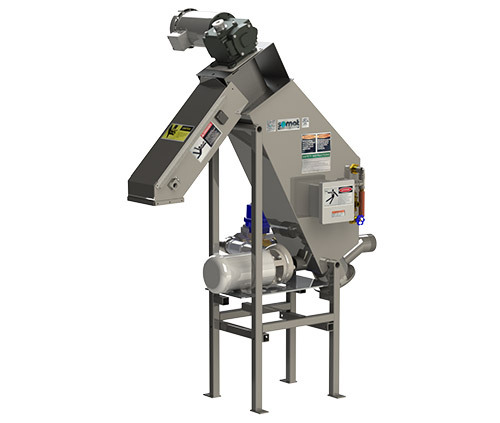 Using a specialized brushed screw augers and cylindrical screen, the Hydra-Extractor removes most of the water and the semi-dry pulp is discharged into a container for disposal. The extracted water is recovered and returned to the pulping tank for re-use, offering significant water savings. A component of the Somat waste handling system. Processes a wide variety of waste types. Capacity to process up to 6000 pounds of waste mix per hour.